The Vertica firewall solution by DataSunrise guards the corporate system against database-specific attacks and insider vulnerabilities. All database queries are obliged to go through the Vertica firewall where they are analyzed according to parameters of rules defined by administrators. Only the queries that don’t violate security policies are allowed to be executed, the others are blocked. Vertica firewall notifies of suspicious activity and helps to detect SQL injections and other types of cyber attacks. whether queries contain signs of SQL injection (UNION and OR statements, double queries, keyword in comments, constant expression). There is an opportunity to set a schedule of policy operation and receive notifications of any security rule triggered. All features are operated within a simple unified interface. SQL injections have become a popular choice for hacker attacks. Malicious SQL statement is inserted into an entry field for execution, exploiting software vulnerability of incorrect filtration. DataSunrise effectively protects against such attacks and blocks queries with signs of SQL injection (Boolean, Union, time delay, out of band, automated exploitation techniques). Continuously monitoring database traffic, the firewall helps to detect security vulnerabilities and users attempting to escalate privileges. Codes of all queries and the results of their execution are stored for further analysis. DataSunrise supports Syslog protocol, thus it is compatible with SIEM systems. DataSunrise Security Suite for Vertica databases can be configured to function as an authentication proxy supporting security policies of Kerberos protocol and Microsoft Active Directory. 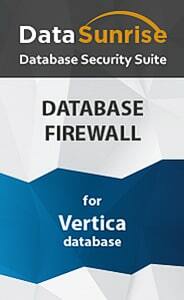 DataSunrise Database Firewall for Vertica is a high-quality solution for protecting against database specific attacks and concealed malicious activity of privileged users. Our firewall assists in complying with PCI-DSS, SOX, HIPAA and other regulatory standards, keeping your sensitive information safe.